Place a sieve on top of a saucepan. Cut passion fruits in half, take pulp with a teaspoon and pour it into the sieve. Add honey to the passion fruit juice and slowly get to a boil stirring continuously. Break chocolate (milk & dark) in a small salad bowl and pour the hot passion fruit and honey mixture on top of it. Let chocolate melt. Gently whisk chocolate mixture until it has a smooth texture and a shiny color. Let chocolate ganache cool down. When it's cold, cover with a plastic wrap and leave in the fridge for at least 3 hours. Sprinkle cocoa powder in a plate. Take a small amount of chocolate ganache with your fingers and roll it between yours hands into small balls. Roll truffles in the cocoa powder. Cover with a plastic wrap and refrigerate for at least 30 minutes before serving. 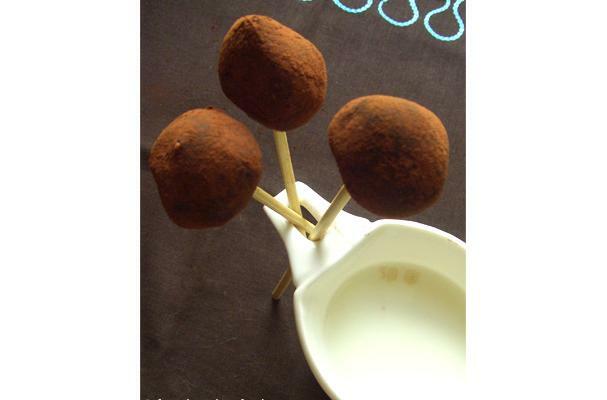 Right before serving you can roll truffles again in cocoa powder in order to give them a nice look.